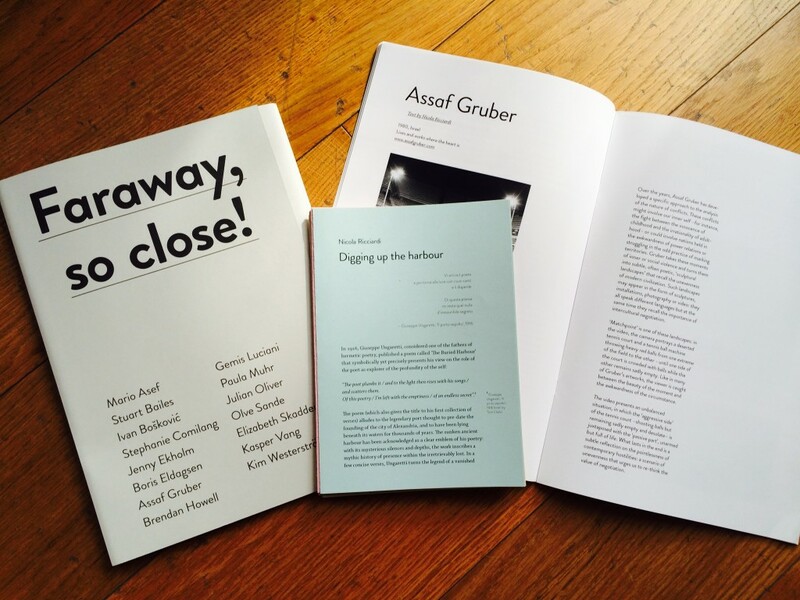 A catalog—published in 2014 by Berlin’s Node Center—that aims to reconstruct the (hi)stories behind the exhibition “Faraway, So Close!”, which was part of the official program of the 7th Berlin Biennale. The current reality is shaped by images, words and forms provided by a variety of media that often lack the slightest shadow of depth. We are fed everyday by jumbled fragments of truth that help us to understand the world more rapidly, nonetheless more approximately. We are overwhelmed by a continuous flux of overlapping stimuli: like the angel Cassiel warns us in Wim Wender’s “Faraway, So Close!” —the movie that named this exhibition—nowadays people are besieged by new lies every day. Ever louder, baser and more intrusive lies, which dull their senses… so they’re unable to hear the message . Has the incapacity to “hear the message” influenced our capability to understand its meaning? Maybe we shouldn’t confuse the abolition of the profundity with the abolition of the meaning itself. What happened is that, once profundity was lost, meaning shifted to inhabit the surface of things. It is as if the tumultuous waves of the sea (of information) have somehow shaken the buried harbor where the secret meaning was kept safe – and now that mysterious treasure has floated up to the shore, where it suddenly appears broken and fragmented but also distributed and spread throughout the surfaces of the world. Today, the ability to reconstruct the meaning no longer means an ascetic descent into the depths of the earth attainable only by an elite few, but a collective ability to recognize patterns in the fabric of reality. This exhibition, in a way, recreates this passage, this shifting, this journey.